We provide three fixed price service packages from our 6 bay state of the art garage. If you want, you are welcome into our workshop so that our technicians can show you any faults on your vehicle, whilst it on our ramps. All of our service packages are extremely comprehensive, please see our Service Plans below. All prices include parts, labour and VAT. All work comes with a 1 Year Guarantee or 10,000 Miles, whichever comes first . * Some vehicles require long-life high performance spark plugs and oil and may incure a small adittional cost – please call for a quote. With the introduction of new legislation, JTT Autotech can service your vehicle at a fraction of the cost of a main dealer without invalidating your warranty. 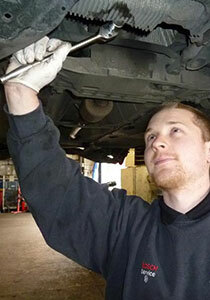 We service all makes of light vehicles in line with manufacturers specifications. Please fill out and submit the booking form below and we will get back to you with a confirmed booking time. Here is our "All Makes Service Plan". You can see exactly what we cover in our Standard, Premium and Major services.